Cars drive over the concrete pad already installed in the northbound lane of Airport Rd. at the northbound Kasch Park station. Weekend lane closures are planned at three Area 2 construction sites this weekend to install concrete bus pads in the driving lanes. Swift Green Line stations were designed with a concrete in-lane pad, rather than asphalt, to better withstand the frequent service of Swift buses and reduce the need for costly maintenance in the future. 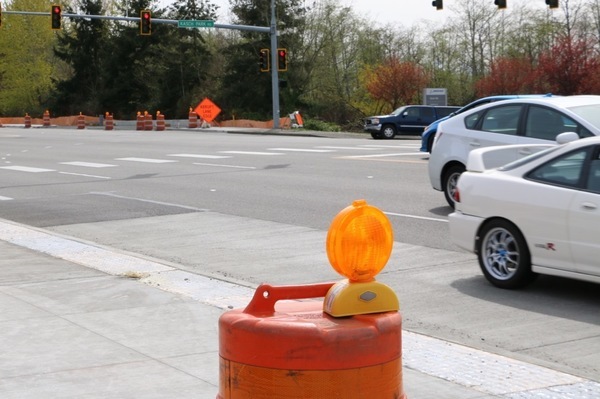 Beginning on Monday, the only work scheduled in Area 2 next week is at the eastbound 132nd St. and 16th Ave site; daytime (9 a.m. to 2 p.m.) work will install concrete curbs and sidewalks and nighttime (8 p.m. to 4 a.m.) work will finish the drainage system. Southbound, Bothell-Everett Hwy. and Trillium Blvd. Southbound, Bothell-Everett Hwy. and 164th St.
Southbound, Bothell-Everett Hwy. and 180th St.
Northbound, Bothell-Everett Hwy. and 180th St.
Area 1 is expected to have very little construction activity in the coming weeks, as most sites have received the steel frame for the future Swift station. Any work in the area next week will be brief and will not impact traffic. Information about Swift Green Line stations is online at www.communitytransit.org/swiftstations. Swift Network News provides the most up-to-date construction information available at publication, but schedules are subject to change at any time. For more information about construction areas, including a map, see the related article below. New concrete continues to flow over the site of the future Seaway Transit Center, which will be the northern terminal of Swift Green Line. On pouring days, there are as many as 30 concrete trucks entering and leaving the site as workers pour new bus drive lanes. When the drive lanes are finished, concrete crews will begin pouring concrete platforms for the pedestrian bus bays. Next week, while masonry is installed on the east side of the mechanical building, other workmen will finish its roof, install its doors and paint its interior. Installation of signal loop detectors at the intersection with the transit center entrance. Easy access of concrete trucks needing to enter and leave the construction site. Law enforcement asks that the public drive slowly through these construction zones and remember that fines double in these areas. Information about the Seaway Transit Center is at www.communitytransit.org/seaway. New traffic signs have been installed on eastbound 128th St. between 4th Ave. and I-5, providing good visuals for the newly created bus-only lane. Concrete work will continue near the Quality Inn and Shell station as crews install sidewalks, curbs and gutters over the next 2-3 weeks. Demolition is scheduled at the Shell driveway and the island near the on-ramp. Nighttime electrical on the traffic signal will continue next week while crews install poles and mast arms. Information about the 128th Street project, including an animated video demonstrating traffic flow, is at www.communitytransit.org/128th. Next Webcast: May 29 at 4 p.m.
With the weather warming up, Swift Green Line construction activity is moving quickly, so there is a lot to keep up with! Join us for 30 minutes on May 29 at 4 p.m. to receive the very latest updates on the Swift Green Line construction projects and to ask questions directly from Community Transit staff. If you can't attend the live webcast, be sure view the recording, which will be posted to our Facebook page and website (with subtitles!) within 48 hours. Community Transit Live is your opportunity to connect with us wherever you are, in real time. Bring your questions and join us on May 29! 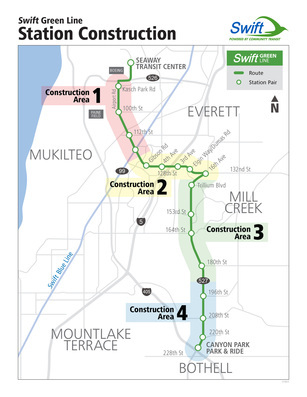 Click here to see how Swift Blue Line and Swift Green Line will connect. Swift Blue Line's stations are getting a facelift this year, with a repainting project kicking off just as a ticket machine upgrade wraps up. This spring and summer, all 33 Swift Blue Line stations will be repainted. The first step in the process is to clean each station with a thorough power washing. Power washing will take place next week during non-service hours and will not affect traffic flow. Painting is expected to begin the week of June 4 and continue through the end of summer. The process of upgrading the ticket vending machines at each Swift Blue Line station is nearly complete; machines have been upgraded at all but three stations. Upgrade crews will continue moving northward until all upgrades have been installed. The project should be complete in 1-2 weeks. Information about Swift Blue Line is at www.communitytransit.org/swiftblue.